Although Omaha Hold’em is a relatively new variation of everyone’s favorite game of skill that is poker, it has quickly gained popularity among poker fans and is available at a large number of established online casinos. Where this variation originated from is still a subject of debates. Some argue it was professional poker player Robert Turner, who introduced Omaha Hold’em to his colleague Bill Boyd. Boyd, who at the time assumed the position of Director of Operations at the iconic Golden Nugget casino, reportedly took a liking to the variation and contributed to the spread of Omaha Hold’em poker. This poker variation bears a great resemblance to Texas Hold’em as it, too, utilizes community cards that are shared by all participating players. So, if you already have experience in Texas Hold’em, you are unlikely to face any difficulties in mastering Omaha Hold’em. However, there are a few noteworthy differences between the two popular poker variations. Read on to learn more about the game’s basic rules of play and find some useful tips that can help you emerge a winner. As was mentioned, Omaha Hold is similar to Texas Hold’em in that it is a community-card poker variation which involves a total of four betting rounds. The number of players at the Omaha Hold’em table ranges between two and ten and a standard deck containing 52 cards is in play. At the start of each round, one of the participating players is given a small, plastic disk called a “dealer button”. This player is referred to as the “dealer”, regardless of whether or not they are actually dealing the cards. Similarly to other poker variations, players take turns in holding the dealer button, which changes hands (no pun intended) in a clockwise fashion after each round is completed. Once the hand is played, the dealer button passes to the player, seated to the left. Before cards are actually dealt to anyone, the two players, who are seating to the dealer’s left are required to pay two forced bets that are predetermined in size, namely the small blind and the big blind. Omaha can be played either with antes or with blinds. In the first case, all players are expected to contribute to the pot with a predetermined amount or an ante, if they wish to enter the game. If blinds are incorporated into the game, the first player sitting to the left of the dealer contributes with the small blind that equals half of the minimum bet at the table. The player sitting to their left pays the big blind, which is equal in size to the table minimum. Both blinds are afterward counted as part of the bets of the two players. The said players are expected to pay the blinds only at the start of the first betting round and will lose them should they decide to subsequently fold hands or in other words, to surrender their claim to the current pot. The objective of the game is simple – each player aims at forming the best possible hand by combining two of their hole cards with three of the community cards. Please note the rules require you to use no more and no less than two of your hole cards in combination with three community cards in order to complete a valid winning hand. This is the biggest difference between Omaha and Texas Hold’em. The player, seating directly to the left of the big blind is the first one to act and is given the option to either call this bet, raise or fold their hand. After they are dealt their hole cards, the other participants also need to call, raise or fold in a clockwise fashion. Five community cards are then dealt face up in the center of the table. After the first betting round is over and all participating players have been dealt their hole cards and have indicated whether they wish to call, raise or fold, the dealer “burns” or discards the card, positioned at the very top of the deck, without showing it to any of the players. The burnt card is never to be played or seen in the game. The dealer then takes three cards from the deck and places them facing up in the center of the table. This stage is referred to as “the Flop”. All players then examine the cards and decide on their next step, but it is the player seating to the left of the dealer button, who has the right to act first. That is, if he or she has not folded during the first betting round. Typically, the bets following the Flop are at the minimum bet level. Players can again choose between calling, raising, or folding before this round is completed. What follows next is what they call “the Turn”. The dealer burns yet another card from the deck, deals one more card facing up and places it next to the Flop. Another round of betting takes place and the player who occupies the seat directly to the left of the dealer is the first to act. The next stage is referred to as “the River”. Another card is burnt or removed from the top of the deck by the dealer and the fifth and last community card is positioned, facing up, next to the Turn. The last betting round begins, followed by the Showdown. Once players have indicated whether they wish to call, raise or fold, everyone is required to reveal the cards they are holding, starting with the player who has bet or raised on the River. The player in possession in the best five-card hand is proclaimed the winner of the pot. Remember that a winning hand in Omaha Hold’em poker can comprise precisely of two hole cards and three of the community cards from the board. It is impossible for a player to form a valid winning hand by using three of their hole cards and two cards from the board or any other combination other than the above-listed one. As for the hand rankings, in Omaha Hold’em they coincide with those in Texas Hold’em. You can read more on this below. In most general terms, a winning hand in poker comprises five cards. Winning hands are formed either by cards of the same suit or by cards that are of the same ranking. Hands that tie are compared according to the ranks of the cards used to form them. If two hands differ by the suit only, they are considered to be of the same rank. The ranking of the cards from the highest to the lowest is as follows – A, K, Q, J, 10, 9, 8, 7, 6, 5, 4, 3, and 2. In poker, the Ace can either be high or low but typically it is high. Below, we have listed all winning hands in poker, ranking them from the strongest one to the weakest one. Royal Flush is the highest-ranking hand in Omaha Hold’em and comprises the following cards: [A][K][Q][J]. This was just an example but the requirement is that the cards are of the same suit and have ranks from ten to Ace. This is a five-card straight which comprises cards of sequential ranking that are of the same suit. It is considered one of the best natural hands in poker. If two Straight Flush hands differ only by the suit, they are considered to be of equal rank. Under high rules, if an Ace is part of the Straight Flush, it is ranked either high (above the King) or low (below the two), but it can never be ranked as both high and low in a single hand. Here are two examples of a Straight Flush:  and . As the name itself indicates, Four of a Kind (also known as Quads) consists of four cards that are all of the same rank and a fifth, unmatched card. The suits are completely irrelevant in this instance. The card of unmatched rank is referred to as the kicker. The hand is ranked first by the rank of its four matching cards and then, by the rank of the kicker. For instance, a player holding Four of a Kind with [Q] would beat a player who holds . A Full House consists of three cards of matching rank and a pair of cards of another matching rank. In case there are two qualifying hands of this type, the tie between the players is resolved first by the rank of the matching triplets and then by the rank of the matching pair. For instance, a Full House of [K][K][K] would beat a Full House of [K][K][K]. If both qualifying hands differ only in terms of suit, then they are considered to be of equal rank. A Flush consists of five cards of the same suit that are not of sequential ranking. The rank of the hand is determined by the highest of the five cards in the Flush. Thus, the Flush is ranked first by its highest-ranking card, then by the rank of the second highest-ranking card, then by the third highest-ranking card, and so on. For example, a Flush of [J] would beat a Flush consisting of . Provided that two Flush hands differ only in terms of suit, like [Q][J] and [Q][J], they are considered to be of equal rank. A Straight hand consists of five cards that are of sequential rank, but are of at least two different suits. Depending on the rules of the game, the Ace can be counted either as a high card or as a low card. For instance, a hand of  is referred to as “eight-high Straight”. In case there is a tie between two Straights, then the higher Straight wins. An example would be a Straight of [A][K][Q][J] beating a Straight of [K][Q][J]. Straights that are of equal value split the pot. Once again, the name of the hand is indicative of what it contains, namely three cards that are of the same rank and two kickers. Please note the two kickers need to be of different ranks because if they are a pair, the hand will no longer be Three of a Kind – it will be counted as Full House instead. This hand is ranked first by the rank of the three “triplet” cards, then by the rank of the higher-ranking kicker, and finally by the rank of the lower-ranking kicker. Thus, a hand of [K] will beat a hand of [Q]. The best possible Three of a Kind hand consists of [A][A][A][K][Q]. A Two Pair contains two cards of the same rank, another pair of cards of equal rank and a kicker card of a different rank. One such hand is ranked first by the rank of the higher-ranking pair, then by the rank of the lower-ranking pair, and finally by the kicker’s rank. From this, it follows that a hand of [Q][Q] would beat a Two Pair of [J][J]. If the hands differ only in terms of suits, they will be considered of equal rank. As the name suggests, this hand consists of a pair of cards of equal rank and three kickers which are of a different rank. An example of a Pair would be [A][A]. One such hand is ranked first by the pair’s rank, then by highest kicker’s rank, then by the second highest kicker’s rank and finally by the rank of the lowest kicker. An example would be a Pair of  which beats a Pair of . This is a hand which contains five cards which are completely different – they neither coincide in terms of suit, not are they of sequential or equal rank. This hand is frequently referred to as No Pair and is ranked first by the rank of its highest card, then by the rank of its second highest card and so on. This means that a player holding a hand of [K] would beat a player holding [Q][J]. One of the most popular variations in Omaha Hold’em is the Pot Limit (PL) where players are allowed to bet as much as is in the overall pot after they have called. This type of betting limit is generally considered inexpensive for the players when they are beginning a hand, but it can prove to be rather costly towards the end of the betting round. Omaha Hold’em can also be played at a fixed limit, meaning that players are allowed to raise the pot no more than four times, with the raise being equal to the blinds in size. Since it is not that costly for players to remain in the game, they rarely opt for folding when playing Fixed-Limit Omaha Hold’em. The No-Limit variations of Omaha Hold’em are mostly considered suitable for aggressive players as they are allowed to bet or raise as much as they want at any point they like. Thus, any given player can move all of their chips in the middle of the table whenever they wish and declare they are going “all in”. From this, it follows there is practically no maximum limit to how much you are allowed to bet at one such table. Yet, there is a minimum bet limit as players are required to raise as much as the previous bet, or more, if they wish to qualify for the betting round. If no player has made a bet yet, the minimum bet limit would be equal to the size of the big blind. Players, who are new to Omaha Hold’em can improve their chances of winning through practice. There are many trusted online casinos which offer their registered members the option to play Omaha (among other poker variations) in Practice mode until they fully master the game and are ready to join the action with real-money bets. Yet, we believe the following few tips can also improve your chances of winning at Omaha Hold’em poker. Players, who have engaged in Texas Hold’em often tend to mistake the strength of their hands in Omaha Hold’em because of the variation’s rule requiring them to form a hand with two of their hole cards and three of the community cards. So make sure you never forget this rule when you join an Omaha Hold’em table. As more community cards are dealt on the board in Omaha, players are recommended to ensure they are well-aware of the three best hands possible and how they might change with the next community card that is to be drawn. Also, it is important to remember that in this game the best hand is often in the nuts, which is why players should refrain from drawing to hands that are not in the nuts. Otherwise, one risks forming a hand that is only second best in ranking, causing them to lose their bet. Remember that this is a very dynamic poker variation in which the strength of your hand and that of your opponents’ hands can drastically change during the betting rounds. Selecting one’s starting hand carefully is also a good idea. If a given player is dealt four hole cards that form a straight, nut flush or higher pairs, this would only work to their advantage. 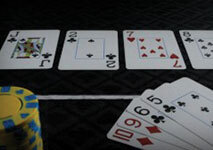 Some of the best starting hand in this poker variation are A-A-K-K, A-A-J-10, A-A-8-3 and 8-9-10-J. Starting hands that consists of 2-2-6-6, A-A-A-A, A-A-4-9 or 2-2-10-J are considered disadvantageous to players. Overestimating low pairs of hole cards is also damaging to the player. If a starting hand consists of all fours, for example, it can be of use only if it flops the set. Then again, a flop consisting of a low set is by itself considered bad in Omaha Hold’em. Another good thing to do is to study your opponents carefully, especially when you are not currently playing any hands. This way, you will be able to see whether your opponents can be easily bluffed, how often they resort to bluffing themselves, and whether or not they have any unique mannerisms which give away information about the hands they hold. On that note, it is worth mentioning that players should allow themselves to be caught bluffing every now and then. This approach will not only diversify your play but will prevent you from becoming way too predictable.